Well now what has happened to all that glorious weather and please come back! It's great for the garden I know but at the beginning of June here we had hot days and rain at night, which was perfect for the garden and for me to sit outside with my stitching in natural light and sew. It has gone all dark and gloomy and the poor light is playing havoc with my stitching. It also makes me want to curl up in a chair and light a fire again ... It has been such dark days this week and It is so much better with the natural sunny light days for tiny stitches. I have fairy lights and little lamps turned on everywhere around the house to make it less gloomy! We have not got out our wooden table and chairs yet. We still have a plastic set out because we were away on May Bank Holiday and we have been busy at weekends and not sitting in the garden we have not yet uncovered it and brought it out from our shed. At the moment it is staying where it is, all tucked up and out of this continual rain! and its the Summer vintage fair. I have been going through my fabrics, quilt pieces, laces, buttons and all sorts of vintage boxes to write my list for tomorrows event. I have decided to put what colour hues of fabrics I need .... I would like some browns and beige colours and some dusky pink as well. Of course if there is stunning fabric and I like the colours that will come home too!! I cant help it. Looking through a box though I found this vintage pincushion that was in a pack that I bought with hand embroidered daisies on it, so that is now out in my sewing room next to my sewing machine.. I love looking through as I often find little things that have been put back wrongly or I have not yet sorted! it is so pretty too. I have a theory, at these vintage events, that if you see it and you like it then get it because the opportunity may never arise again. It antique/vintage so it is not like you can pop back tomorrow to the shop and say yes please I will have a metre of that fabric!! I know for a fact that Rosie's Armoir will be there tomorrow and she does some great fabric packs so I know I will come home with some of those beauties. I have been in touch and asked about the light brown/beige colours so she said she would have a look for me, so that is where I will head first to find her. 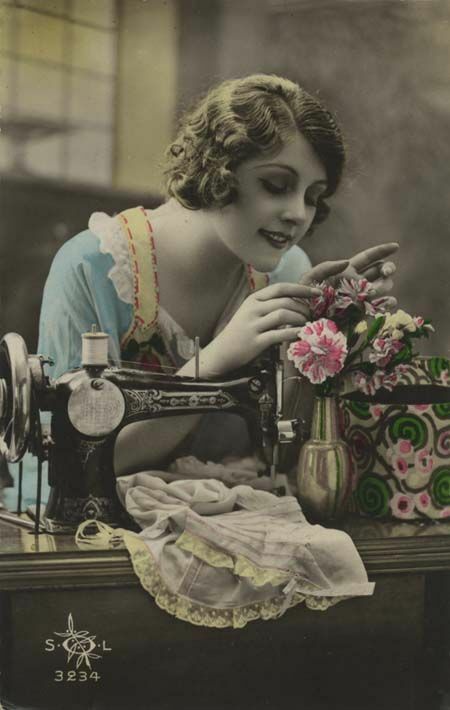 I would like to find some more antique carved mother of pearl buttons as well, they are firmly on my list of yes pleases ... and some lovely and unusual laces to attach and build up on stitchery art too. Another favourite on my list is old quilt pieces so I have a little list and also an open mind. I take cash with me so that I know what I am spending and of course not everyone has a card machine there either. But for now I am getting on with my hand embroidery. If I sit in the conservatory then there is better light, it just depends how hard it is raining because it can become deafening at times. I hope that you have a wonderful weekend and do not forget there will be a blog tomorrow so come back for a vintage read. I will take photos and post about the show on Tuesday probably we will see. Rain Rain go away, come again another day! Mixing it up a little .... New design on its way.